PLAYED ON A CHAMPIONSHIP HIGH SCHOOL BASKETBALL TEAM TWENTY YEARS AGO? Sheriff Lexie searches for the sin that put the players on the kill list. When Sheriff Lexie discovers there are three secrets she fears more women will die while the investigation goes in muliple directions. Donna seems like a nice person, but for some reason she keeps murdering people on paper. Perhaps there is a dark past that she doesn’t divulge. 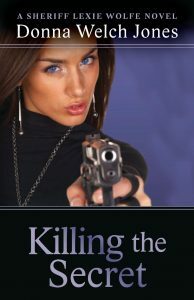 KILLING the SECRET is the first book in the six book Sheriff Lexie series. Donna has placed in the Writer’s Digest National Writing Competition, and at the Oklahoma Writer’s Federation Conference. She was honored to be selected the 2017 Tulsa Nightwriter of the Year. She hopes Sheriff Lexie will solve the mysteries before the reader.